Yannick and the banda wore last season's shirts, which also had not been washed since then either, so we didn't smell that good. But the girls made up for us by turning on the style. of bottles home, with his own special 'à la Perry' label. We can make labels for all your own jams and conserves! The liner in position just as the gravel arrives, we then spread it out with the digger. Perry wondering how it will all end. Positioning the planks and railway sleepers to keep the court in shape, the grass out and the to act as an 'out of bounds' during play. The poplar beams dropping into place. Three generations of Fourquets helped us that day. The drinks circle is on the left. Our friend Alain Fourquet and his son Damien are avid rugby fans and follow Trie FCT. This year FCT were in the Championat so were in several play-off matches to see if they would be promoted to the next division. They turned up early one Sunday morning, ready for the match in Bagnère de Bigorre. Alain's van being yellow, he just had to cover it with black tape and flags made by Véronique to turn it into the FCT mobile. 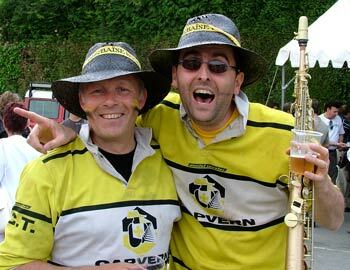 Off we went, all togged out in yellow and black, with car loads of fans from Trie and the surrounding villages. To pep up the team, the banda, led by Yannick - our friend who runs the DIY shop in Trie - played all the way there, through the match and afterwards to a slightly disappointed following. Trie lost but still had a chance. The next match was two weeks later in Les Landes, but after leading, FCT lost in the last few minutes and so will have to try for promotion again next year. Still, we all had a great time and the spirit of FCTs fans made each match a lot of fun. So much so that Perry decided to join as a dirigeant at the club. This is a glorified name for one of the old players who now cater for the teams, make dinner on training nights and man the bars on match days. A great excuse for a lads' night out and for Perry to get to know more of the characters in Trie. 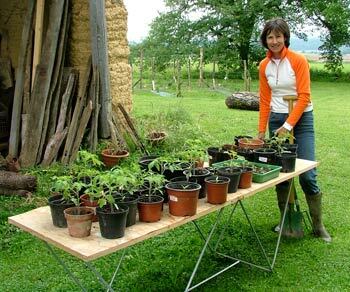 By moving the table of pots out into the sun during the day and into the cover of the open barn for the night, Caroline managed to nurture some fantastic plants for the vegetable garden. After 15 March and when the moon was just right, she got them all into the ground. Old roof tiles set up against the support poles to keep the cold wind off in the beginning and hay around the roots to keep the moisture in and the weeds out. All went well for a week or so, but the wet, cold weather came and nearly every plant rotted and died, or just simply didn't grow any more. The slug and snail invasion did the rest. So a second wave of seeds and plants were prepared and planted, this time with a little more success. 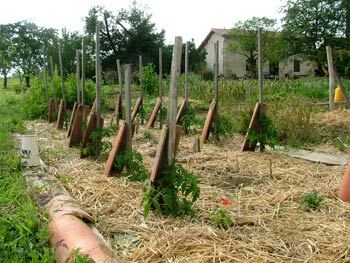 By growing Bio and not using any chemicals or synthetic snail killers, the garden is more work to keep under control. A week of rain and the weeds will engulf everything. I often saw Caroline bending down scraping away and pulling wheelbarrow's full of weeds away. That makes the final produce all the more special. As the weather gets warmer, the outdoor activities start up. 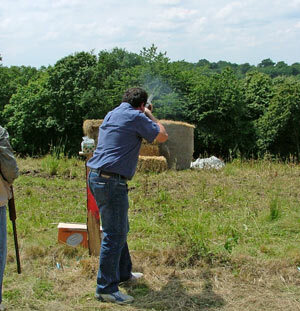 One weekend, we were invited by Christian to come watch a ball trap or clay pigeon shoot. Following some battered old direction signs, we found the field and the members of the club de chasse all ready to go. The automatic launcher in place and tested, they fired off in a row of five, each moving across to the next position on the right, after each shot. This makes the chances more equal since the launcher throws the discs out at different angles and heights. The sound was deafening and we realised that some ear plugs would have been a good idea. A few weeks later, we went again and Perry had a go. Not having fired a rifle since his days in the army cadets and rifle club at school, the shotgun's twin barrel, single-trigger action took some getting used to. The sighting was very difficult too since Perry had always shot at static targets, albeit much further away. Still, he managed to miss all his discs and came away with a tender cheekbone from where the first kickback took him by surprise. He also had a ringing in his ears for the rest of the day! 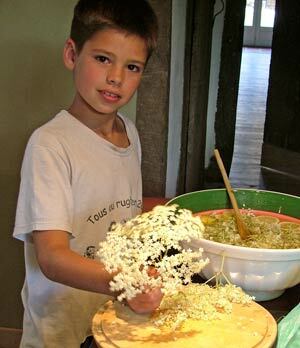 We have a lot of elderflowers near the house and had received a recipe for elderflower syrup from our friends, John and Marie Perrin, who run a gîte in the Gers. Caroline went off with a ladder, scissors and a basket and came back with a huge crop to infuse. Damien came over and helped out with the stirring and the end result is a delicate, sugary syrup that we dilute with water and add ice. 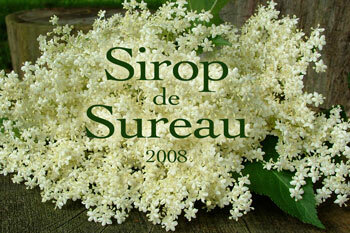 A fantastic thirst quencher in the Summer. Perry decided for his 50th birthday to give himself a boules court. Something he could share with his friends. So we asked Didier from Libaros to quote and come lay it for us. It involved a mini digger carving out the foundations and levelling off the surface. Then as that was done, we laid down an anti-weed material, which is a tightly woven synthetic fabric that alows water to pass but keeps roots and shoots out. 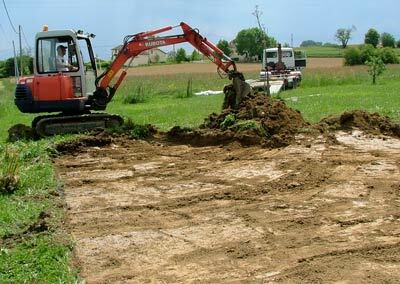 This was followed by a layer of rough gravel and sand, which was passed over with a vibrating roller to compress it into place. A few days of rain helped to settle the grains and compact it even more. Caroline came up with the genius idea of adding an 'aperatif corner' to the court. So a half circle was added along one side and given the same gravel and sand floor. 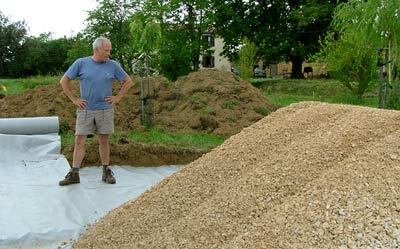 Meanwhile, we had spoken to Alain Fourquet and he said he had some old poplar wood beams we could have to frame the court. 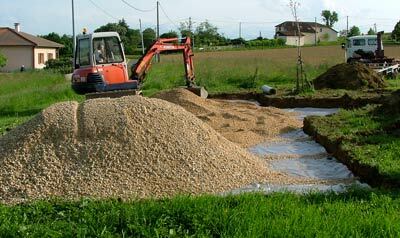 This would keep the sand in place and act as a border for the surrounding grass. 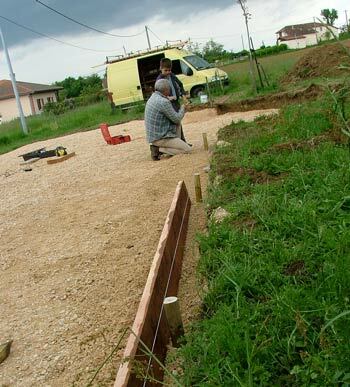 He also helped us find a source for railway sleepers which we fetched in his van in Tarbes. We needed eight to cover the 18 metres of the court. Painting all the wood with old motor oil and pouring gravel in behind them, we hoped to protect the wood from rotting too soon. Finally, Didier came back and a fine sand was delivered. This was raked evenly over the surface and left to sink in for a few weeks as the heavy rain washed the grains into all the gaps and created a hard, compacted surface. Perry couldn't wait to throw a ball, but had to wait until mid June before his dream came true. 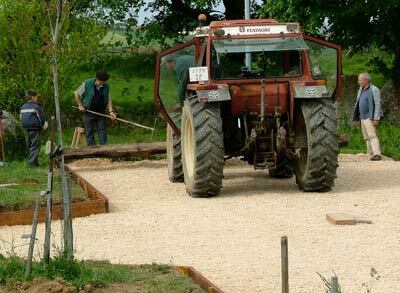 Fancy building your own boules, or pétanque court?